Many families wonder if stay-at-home moms need a life insurance policy in place. As a stay-at-home mom, you may write off the idea of a life insurance policy for yourself because you're not the one bringing home the bacon, so-to-speak. However, the impact of losing you would not only be emotionally shocking for your family, it could be financially devastating. A mom's last will and testament protects her family's future and so does a whole life insurance policy or term life insurance policy. There are many reasons why stay-at-home moms need life insurance in place. In 2014, the same website released a report that says stay-at-home moms in the U.S. would earn $118,905 per year for their many job roles. Still think you're a stay-at-home mom with no cash value? Just because you're not receiving a signed paycheck doesn't mean you don't contribute to your family's income. If something happened to you, your spouse is probably going to need some outside help to cover your absence. In 2006, financial guru Dave Ramsey estimated a $300,000-$400,000 policy would be necessary to make up the costs of everything a stay-at-home mom does every day. You can't be replaced, of course, but someone can be hired to help keep your family functioning as normally as possible under the circumstances. One of the biggest, long-term expenses your family will face without you is the cost of child care. Parents paid an average of $15,895 for full-time infant care in a center, according to the National Association of Child Care Resource and Referral Agencies (NACCRA). One year of after school care at a center averaged $10,720 per child. A spouse whose job requires travel or nighttime hours is going to be hit even harder. Extended care and evening hours can quickly eat into a family's bank account. Without you, someone else will have to take care of your children while your spouse is working. Choose a life insurance policy amount that includes these annual costs. For homeschooled children, losing their mom also means losing their teacher. You and your spouse need to decide who will educate your children if you were to pass away. The cost of private schooling or a private teacher is a consideration for your life insurance needs if you prefer to keep your children out of public schools. A life insurance policy can also help pay for your kids' college education. The College Board has released 2008-2009 numbers for college, indicating tuition hikes of 5.9%, on average, for private colleges and 6.4% for public colleges. That's about $381 to $408 more in just one year. If a mom of young children died today, think of how high a college tuition's price tag will be set by the time her kids are 18. The College Board's cost calculator estimates a four-year student entering a public college in 2015 will pay an average of $25,996 per year for his education. That number rises to $34,788 for a student entering the same college in 2020. Your life insurance policy may not cover all of the costs of a college education. It can be a soft cushion for your child to get an education without accumulating a lot of debt, though. We want to give our children so much. Toys when they're younger. Cars when they're old enough to drive. Beautiful weddings they'll never forget. You can leave a small nest egg behind to help your children when they're grown. Giving your kids a portion of your inheritance can give them a head start when they're adults. It's not the same as having you there but it's one way to help your family out if you're not able to be around. An inheritance doesn't have to be millions of dollars. Busting your budget on extra life insurance now so your children can benefit after your gone isn't cost-efficient for most families. The National Funeral Directors Association reports an average funeral cost of $7,045 for 2012. That's a price tag many families couldn't absorb without life insurance. Add on the new expenses for running the household, child care and education and losing you has become a major financial setback your family has to deal with on top of their grief. The good news is, your life insurance policy can help offset all of this potential loss of income. Money won't take your place but knowing your family will be taken care of if you're unable to can give you peace of mind. Chances are, you'll be here to spoil your grandchildren and maybe even your great grandchildren. 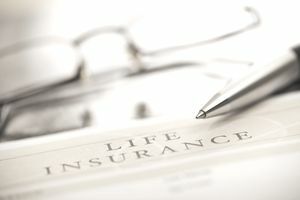 For many families, though, paying a life insurance premium's few dollars a month makes perfect sense. With a little research, you can find a life insurance policy that fits in with your family's budget that will help you sleep at night, knowing your family is protected should something happen to you.